Pilaff is a classic rice-based dish from the East. It is always started by browning the rice in butter or oil before cooking it in stock. Heat the oil in a large pan and gently fry the onion for 5 minutes, until softened. In a large jug, make up the stock by dissolving the stock cubes in 1 litre boiling water. 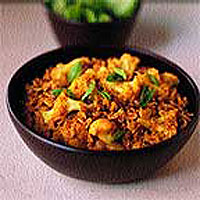 Add the rice and cauliflower florets to the pan and cook for a further 1-2 minutes. Stir in the curry paste and lentils then add the hot stock. Bring to the boil, cover and simmer gently for 15 minutes, or until the rice and cauliflower are tender. Season with pepper to taste, garnish with some fresh mint leaves and serve with a crisp salad. If you prefer your rice to have a looser consistency and the grains to separate, rinse the rice thoroughly under cold, running water before cooking. This will remove the starch.